Children and animals are the most vulnerable creatures on this earth. I think that is why children relate so well to animals. Both are at the mercy of the adults who care for them. One of the most priceless gifts a child can receive is the gift of a pet. National Kids and Pets day was created in 2005 by Colleen Paige. Its primary goal is to bring awareness to the magical bond that children and animals share. 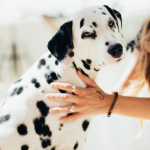 It is known that animals like dogs and horses are used for therapeutic purposes; however, family pets can also provide emotional support to children. A child receives unconditional love from a pet. Pets don’t have expectations; they don’t shame; they don’t criticize; they don’t judge; they don’t need to be pleased; and they don’t punish, demean, or lecture. Pets accept a child for whom he or she is. When a child is unable to share their pain with an adult, pets become their sounding board. Even the act of petting an animal can release a child’s anxiety. 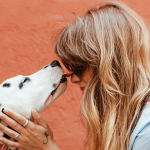 Besides providing social and emotional support, pet ownership has many more benefits. Children can pick up on an animal’s emotional state. If a pet is scared by fireworks or a storm, a child can comfort it. If a pet is hungry, a child can feed it. If it is sick, a child can nurture it. Not only is empathy a wonderful human quality, it can be taught effortlessly by a pet. Suggested Read: Empathy Versus Sympathy: What Do We Need? 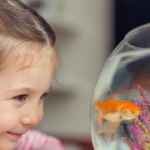 Even at an early age, a child can put food or water in a bowl or help clean a cage or an aquarium. As they grow older, children can groom pets, pick up waste or clean a litter box, and even administer medicine. The first loss a child may experience is the death of a pet. Losing a beloved animal teaches children that the feelings surrounding loss are painful but temporary. In time, adding a new pet to the family helps a child realize that they are capable of loving again. Experiencing the loss of a pet can help a child navigate the grieving process when faced with other life losses. Learning how to be gentle with an animal or understanding the importance of allowing a pet to sleep or eat undisturbed are important components of showing an animal respect. If a child learns to respect an animal, they can learn to respect other children. Suggested Read: Don’t Flush Your Goldfish. Say Goodbye. Training a pet requires patience. It shows children that it takes time and determination to teach an animal a new skill, and it takes time and effort for an animal to acquire the skill. Caring for a pet builds confidence. Whether it’s teaching a pet a new trick or feeding an animal everyday, the task will give a child a sense of accomplishment. Research also indicates that pet ownership during the first year of life can lead to better resistance to infectious respiratory illnesses and ear infections as well as a reduced need for antibiotics during childhood. Finally, James Cromwell points out, “Pets are humanizing. They remind us we have an obligation and responsibility to preserve and nurture and care for all life.” What a wonderful lesson to teach a child.